Woodcut showing the effects of tornadoes and thunderstorms (Cap. XI ”De violentia turbinis, ad tempestatis”) from Historia de Gentibus Septentrionalibus (A Description of the Northern Peoples) (Rome, 1555) a monumental work by Olaus Magnus (1490–1557) on the customs and folklore of the Nordic countries. This is one of the earliest depictions of the damages associated with tornadoes. source: Magnus, O., 1555: Historia de Gentibus Septentrionalibus (A Description of the Northern Peoples), Rome, 815 pp. [PDF, via Google Books]. 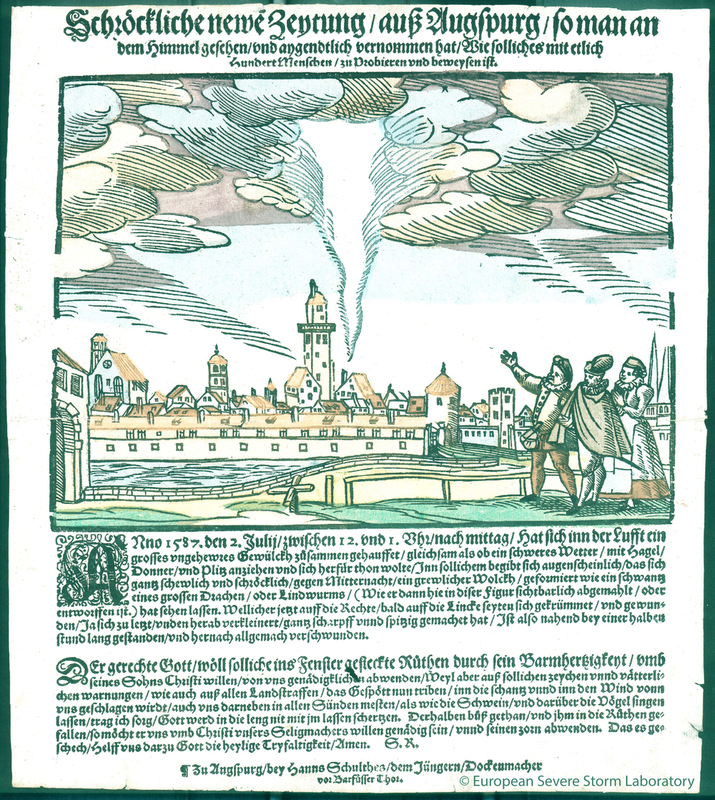 A funnel cloud over Augsburg, Germany on 2 July 1578 reproduced in facsimile by Gustav Hellmann (1854–1939) in 1899 in a collection of old meteorological works. Wegener (1917) considered this to be the first representation in Germany of a tornado, and probably one of the first in the world. "In the year 1587 on 2 July, between 12 and 1 o'clock in the afternoon an immense high cloud gathered, as if a heavy storm [ein schweres Wetter], with hail, thunder and lightning was about to break forth. And so it happened that a dreadful cloud, hideous and terrible, formed like a tail of a big dragon [ein Schwantz eines Drachen oder Lindwurms] (as you can see, clearly depicted, in the figure). It was first on the right but soon wound itself to the left flank; at its downward end it became smaller [verkleiner], sharp and pointed [scharpff und spitzing]. It remained upright thus for almost half-an-hour, and afterwards gradually disappeared." source: courtesy of the European Severe Storm Laboratory. The Great Meteorological Chart from "Cosmic Meteorology" (1623) by Robert Fludd. See this blog entry for more details (image courtesy of archive.rog). source: Fludd, R., 1623: Philosophia Sacra et Vere Christiana seu Meteorologia Cosmica. Frankfurt. Waterspout off the coast of Sardinia on 31 December 1648: "We have arrived close to Tolara, an island joined to Sardinia. There I drew the figure of a siphon [i.e., from Greek meaning pipe or tube]" (see also this blog post). This woodcut illustration of a tornado or a waterspout (4. whirl-wind) is from Orbis Sensualium Pictus (Visible World in Pictures) by the Czech philospher, pedagogue and theologist Ioannes Amos Comenius (1592 –1670). Published in 1658, Orbis Sensualium is considered to be one of the first illustrated books intended for children. source: The Orbis Pictus of John Amos Comenius (edited by C. W. Bardeen, 1887) (PDF, via archive.org). A description by the English naturalist Robert Plot (1640–1696) of a tornado (i.e., Typhon or Tornado-wind) that occurred in Staffordshire (United Kingdom). A description of a spout [waterspout] by Jean de Thévenot (1633–1667) a French traveller, linguist, natural scientist and botanist. The waterspout occurred on 11 December 1665 "northward between us and the isle of Quesomo [Kish Island in the Persian Golf] about a Musket shot [approximately 275 m] from the Ship" (Thévenot 1687, p.185). sources: The travels of Monsieur Thévenot into the Levant. In three parts. Viz. into I. Turkey. II. Persia. III. The East-Indies. Newly done out of French. London, 1686, Printed by H. Clarck, for H. Faithorne, J. Adamson, C. Skegnes, and T. Newborough, Booksellers in St. Paul's Church-Yard, MDCLXXXVII. via archive.rog. two Clouds, with a violent Displosion of the Air; that descends almost Perpendicular to the Earth.” (Bohun 1671). Reference: Bohun, Ralph, 1671: A Discourse Concerning the Origine and Properties of Wind. With an Historicall Account of Hurricanes, and Other Tempestuous Winds. Oxford, 302 pp. The illustration is from Francois Lamy (1636–1711) description and analysis of a tornado that occurred at Reims (France) on 10 August 1680. Depictions of waterspouts from Le Forze d’Eolo, Dialogo Fisico-Matematico Sopra gli Effetti del Vortice (1694) by the Italian astronomer Geminiano Montanari (1633–1687). Montanari's "physical-mathematical dialogue", mainly a theoretical discussion on tornadoes, is describing the effects of a tornado that occurred in the State of Venice about 5 p.m. on 29 July 1686 causing damages in Mantova, Padova and Verona. Source: Montanari, Geminiano, 1694: Le Forze d'Eolo. Dialogo Fisico-matematico sopra gli effeti del vortice, o sia turbine, detto negli Stati Veneti la bisciabuova. Che il giorno 29 Luglio 1686 ha scorso, e flagellato molte ville, e luoghi de'territorj di Mantova, Padova, Verona, etc. Opera postuma del Sig. Dottore Geminiano Montanari Modanese, Astronomo e Meteorista dello Studio di Padova. In Parma, ad instanza d'Andrea Poletti. Parma : A. Poletti, 342 pp. [PDF courtesy of Biblioteca Europea d'Informazione e Cultura]. Figures courtesy of BibliOdyssey. A "rude draught" illustration by Mr. Zachary Mayne of the passage of an waterspout at Topsham "on the river between the sea and Exeter" on 7 August 1694 at 09–10 am. The river Exe is indicated by +++ and O shows the waterspouts. The letter L, S, G, M, W are indicating houses were the waterspout produced damages. "The march of the waterspouts" is showed by EEEEE, X are "the planks that were blown from upright", D is ship "shaken but not hurt", K is "a mast of near a tun weight, thrown out of its place", W is an "anchor that was torn out of the ground and carried seven or eight foot with a boat that was fastened to it", B a "new boat blown about six foot high and turn upside down" and A is "a fisher boat with one man in it which was near the place where the spout was at first perceived, but through mercy escaped." source: Mayne, Z, 1694: Concerning a spout of water that happened at Topsham on the river between the sea and Exeter. Phil. Trans., 19 28–31. [PDF via The Royal Society]. Depiction "Typhon" from a series on "The Greek Gods" by the Bohemian etcher Wenceslaus Hollar (Václav Hollar) (1607–1677). Born of Mother Earth Gaia and Tartarus, Typhon commands the destructive winds of the world, which he used on land to destroy crops and in water to sink ships and drown sailors. Several sources (e.g., Pindar) locate Typhon's birth and dwelling place in the vicinity of the ancient Cilician coastal city of Corycus (Kızkalesi, Turkey). This is a region in which, according to a recent climatology, tornadoes and waterspout are observed relatively frequently. source: artwork from University of Toronto Wenceslaus Hollar Digital Collection scanned by University of Toronto, high resolution version extracted using custom tool by User:Dcoetzee via Wikipedia. Drawings by Mr. Alex Stuart of a series of waterspouts in the Mediterranean Sea observed on 28 August 1701 from the Barbary Coast (North Africa), north of the town of Bona (Algeria). Tab. 6 - Fig. 1: A) "a perpendicular spout beginning to fall", B) "the beginning ascent of the water of the sea under it", Fig. 2: A) "one oblique spout beginning or darting itself out of the clouds", B) "the rising or boiling of the water, answering to it in an oblique line". Waterspouts observed on 13 November 1725 by Renaus des Marchais (16..-1728? ), a French cartographer and navigator, during his travel on the west coast of Africa from Sierra Leone to Liberia. A beautiful representation of a tornado near Hague (Netherlands) on July 1751 by the Dutch lawyer Jan Francois Dryfhout. More info at: https://bogdanantonescu.squarespace.com/blog/2015/8/27/a-tornado-near-hague-on-july-1751. source:Dryfhout, J. F.: Nauuwkeurige beschouwinge van een hoos, benevens een ondersoek, hoe dezelve geboren worden en werken (A detailed examination of a tornado formation and additional research on how they form and function). Verhandelingen uitgegeven door de Hollandsche Maatschappij der Wetenschappen te Haarlem, 3, 321–377. (PDF via Google Books). This "remarkable meteor" occurred on 21 September 1760 at Oxford (United Kingdom) from 18:40–19:29 and was described by the Rev. John Swinton (1703–1777, a British writer, academic, FRS, clergyman and orientalist) in a letter to the Rev. Thomas Birch (1705 –1766, a British historian and secretary to the Royal Society between 1752–1765). "A dark cloud, like a pillar or a column or thick black smoke, and perpendicular to the horizon, appeared in the N. W. pushing gradually forward towards the zenith, and at last extending itself almost to the opposite part of the heavens" (Swinton 1761, p. 99). This illustration (Plate XL, p. 517–21) of the evolution of a waterspout appeared in second volume of Introduction to Natural Philosophy (1762) by Pieter van Musschenbroek (1692–1761) a Dutch mathematician and physicist who discovered the principle of the Leyden jar about the same time (1745) as Ewald Georg von Kleist. Detail showing the upper part of Plate XL from van Musschenbroek (1762). A similar schematic representation of the evolution of a waterspout was include in the Physisk Beskrifning öfver Jord-Klotet (1774) by Torbern Olof Bergman (1735–1784) a Swedish chemist and mineralogist who made important advances in the theory of crystal structure. source: Bergman, T. O., 1774: Physisk Beskrifning öfver Jord Klotet, vol. II, Upsala : Tryckt hos Joh. Edman Kongl. Acad. Boktr. via Linda Hall Library of Science, Engineering & Technology. The evolution of a waterspout, plate II from "Encyclopédie ou Dictionnaire Raisonné des Sciences, des Arts et des Métiers" (Encyclopaedia, or a Systematic Dictionary of the Sciences, Arts, and Crafts) published in the under the direction of Denis Diderot (1713–1784) and Jean le Rond d'Alember (1717–1783). source: ARTFL Encyclopédie Project - Robert Morrissey, General Editor; Glenn Roe, Assoc. Editor (http://encyclopedie.uchicago.edu/). Plate II can be found here and the entry on Trombe (Waterspout) can be found here (vol. 16, 689–692). Waterspouts (a, c, e, f, h) observed from Leiden on 17 September 1771. In the distance Oegstgeest (1), Noordwijk (2), and Voorhout (3). Pen drawing of a waterspout over the Atlantic Ocean (c. May 1778–Oct 1787) from the sketchbook of Jan Brandes (1743–1808), a Dutch pastor, draftsman and watercolorist. Waterspout observed by M. Michaud at Nice (France) on 12 April 1780 between 15:00–16:00. Fig. 1 represent the waterspout as was observed initially. The waterspout moved toward the Port of Nice and separated into two structures (Fig. 2 ) with the main one indicated by (abc). The two structures then rejoined as in Fig. 3. The waterspout dissipated (Fig. 4a) and a new one started to form (Fig. 4b). Depictions of waterspouts from De l'électricité des météores (Paris, 1787) by Pierre Bertholon de Saint-Lazare, a French physicist and member of Société Royale des Sciences de Montpellier, mainly known for his theories and experiments on atmospheric electricity. Figure 24 shows a descending waterspouts. Ascending waterspouts are represented in Figs. 24 and 26. Fig. 27 is an example of an ascending and descending waterspout and Fig. 28 an example of a joined ascending and descending waterspout. Other waterspout morphologies as shown in Fig. 29, a waterspout whose cone axis is inclined, and Fig. 30, a curved waterspout. Waterspouts observed on 24 May 1788 (Figs. 1 and 2), 8 January 1789 (Figs. 3 and 4) and 12 April 1789 (Figs. 5 and 6) by Francis Buchanan (1762–1829) a Scottish physician, geographer, zoologist and botanist, during his voyages to India. "[...] I observed a curve spout come from the cloud, as shown in Plate IX. Fig. 1. b, the concavity of the curve being windward. At the same time, or at the next moment after observing the spout, I perceived a thick cloud or fog arise from the sea, c. Very soon afterwards, the spout rushed down and joined the cloud, which had risen from the se; and, at the same time, thin rose higher, and contracted its diameter, as in Fig. 2. The water spout being now completely formed, the appearance of it was as follows: The cloud a, from which the spout descended, moved slowly along, and probably, by this means, produced the curvature in the spout. The body of the spout b, tapered gradually downwards, and was seemingly more dense than the cloud from which it descended, but not more dense or black than cloud often are. The fog coming form the sea was of the same colour as the spout, and resemble the smoke of a steam-engine. During the whole time, the surface of the sea under the spout was evidently in violent agitation, and full of white waves; at the same time noise was heard, like that of an immense waterfall. From the formation of the spout, till the time it reached the cloud arising from the sea, appeared to be about two minutes. The spout then began to withdraw itself into the cloud, from whence it had descended; while the cloud bellow gradually withdrew into the sea; and in about three minutes all was over, and the thick cloud in the sky, in a short time, was entirely dispersed. " (Buchanan 1821, p. 275– 276). "[...] at half-part eight in the morning, we observed like a thick cloud resting on the sea, Fig. 4. a, and bearing from us from W. by N. from four to six miles distance. [...] To the southward of it was a heavy rain, b. [...] A spout then came down from the cloud in the form of an elbow; but before he gave me notice, the spout had disappeared, and nothing remained except the cloud on the water. About half an hour afterwards I was informed, that the spout has returned. Upon coming on deck, I observed the cloud Fig. 3. a, and the rain b as before; and a new spout was then formed, where the former has been. The spout c was cylindrical, and slightly bent by the wind to the north. Below it terminated in a point about 300 feet from the sea; above it was suspended from the cloud, but became rather narrower, having sent off two branches d, d. It was every where of a define form, and much of the same density with the cloud. In looking at it with a glass, I at first took it to be hollow; but I soon discovered, that this was owing to the middle appearing lighter than the sides, as it must do from the known laws of optics. From the sea arose a circumscribed conical cloud e, nearly of the same density with the spout. After continuing about then minutes by a watch, the spout and both clouds became gradually lighter coloured, till they entirely disappeared." (Buchanan 1821, p. 277). source: Buchanan, F., 1821: Account of Water-Spouts observed at Sea on Voyages to and from India. The Endinburgh Philosophical Journal, 5, 275–279. (courtesy of Google books). An illustration by Catherine Haussard of the structure and appearance of a waterspout - based on the theory proposed by Benjamin Franklin (1706–1790) - from "Mémoires sur la Météorologie" (1788) by Louis Cotte (1740–1815). Louis Cotte was an influential 18th century French meteorologist, member of the Académie des Sciences in Paris and the Societas Meteorologica Palatina. Cootte provided in his two major works, "Traité de Météorologie" (1774) and "Mémoires sur la Météorologie" (1788), meteorological observations, theories on the formation of meteorological phenomena and descriptions of meteorological instruments (figures 2–4 are showing atmometers or evaporimeters, instruments for measuring the rate of water evaporation). source: Cotte, L., 1788: Mémoires sur la Météorologie (vol. I), L'Imprimerie Royale, Paris, pp. 635. via Google Books. The "embrion of a waterspout" at Nice on 6 January 1789.
source: Michaud, 1801: Observations sur les trombes de mer vues de Nice en 1789, le 6 Janvier et le 19 Mars.Memoires de l' Acad. de Turin, Tome 6, p. 3–22. (via gallica.bnf.fr). The first waterspout observed at Nice on 6 January 1789. The evolution of the second waterspout observed at Nice on 6 January 1879. Waterspouts observed at Nice on 19 March 1789. Waterspouts observed at Nice (France) on January 1789.
source: Michaud, 1801: Observations sur les trombes de mer vues de Nice en 1789, le 6 Janvier et le 19 Mars.Memoires de l' Acad. de Turin, Tome 6, p. 3–22. (personal collection). Waterspout observed over Lake Geneva (Switzerland) by M. Wild, captain-general of the mines, on 1 November 1793 at 08:35. In the figure a) represent the waterspout ("the column"), b) "the black cloud to which [the waterspout] was adjoined", c) "the bottom of the column was the most transparent and barely visible and it resembled rather to a rising steam", and d) "accumulated water from the lake"
Waterspout off the coast of Villefranche-sur-Mer (France) in 1795. Lithography by Godefroy Engelmann (1788–1839) and drawing by Louis Albert Guislain Bacler d'Albe (1761–1824). source: Souvenirs pittoresques du Général Bacler d'Albe, 1818, 104 illustrations (Bibliothèque nationale suisse) via Viatimages. The earliest tornado documented in Estonia occurred on 22 June 1795 in Livonia, a historic region along the eastern shores of the Baltic Sea today divided between Latvia and Estonia. The event was documented by Johann Christoph Brotze (1742–1823) a German pedagogue, artist and ethnographer in his ten-volume work entitled Sammlung verschiedner Liefländischer Monumente, Prospecte und dergleichen (A collection of various Livonian monuments, catalogues, coins and the like). The description of the tornado appears on volume 10, p. 151–152. For more information on this event Leighly (1974) is an excellent reference. Tornado–Zeus Battling Typhon, by William Blake (1757–1827) after Henry Fuseli (1741–1825), monochrome shaded line drawing from the third edition of Erasmus Darwin's (1731–1802) The Botanic Garden (1795). source: The Elisha Whittelsey Collection, The Elisha Whittelsey Fund, 1966 via The Metropolitan Museum of Art (New York, United States). Naval vessel at sea, firing a gun, with waterspouts starboard (righ) and port (left), watercolour by D. Tandy (sketchbook, 1798). source: This is a part of the National Maritime Museum's collections (London) [copyright National Maritime Museum, London via europeana.eu]. A waterspout observed over the Atlantic Ocean on 5 April 1820. Sketched from nature by P. S. and coloured lithograph by Agostino Aglio (1777– 1857). source: this file comes from Wellcome Images, a website operated by Wellcome Trust, a global charitable foundation based in the United Kingdom. "In the month of July, 1800, Captain Ricketts was suddenly called on deck, on account of the rapid approach of a water-spout among the Lipari Islands; it had the appearance of a viscid fluid, tapering in its descent, proceeding from the cloud to join the sea; it moved at the rate of about two miles an hour, with a loud sound of rain; it passed the stern of the ship, and wetted the after-part of the mainsail; hence Captain Ricketts concluded that waters-spouts were not continuous columns of water; and subsequently observations confirmed the opinion" (Polehamton and Good 1821). source: Polehampton, Ewd. and John M. Good, 1821: The Gallery of Nature and Art., vol. IV, London, p.552. Accessed via archive.org and digitized by Google. Waterspout at Reao (French Polynesia) observed on January 1826 by Captain Frederick William Beechey (1796–1856). 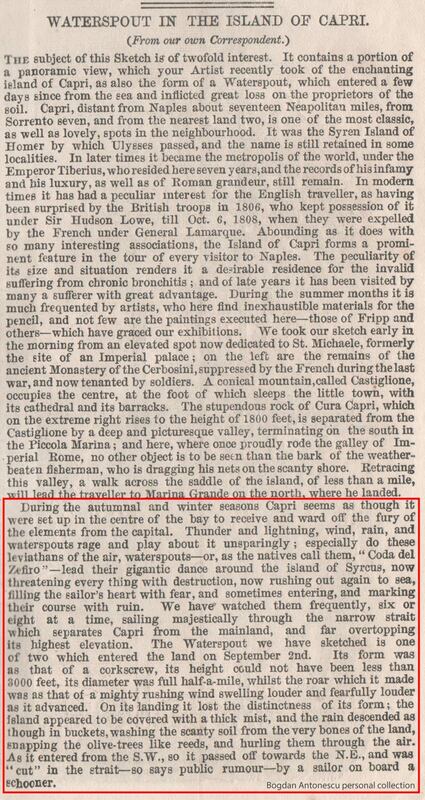 The description of the waterspout that occurred at the Lipari Islands was also include in A London Encyclopaedia (1829). source: A London Encyclopaedia, or Universal Dictionary of Science, Art, Literature and Practical Mechanics, vol. 14, London: Thomas Tegg, 1829. Accessed via archive.org. Waterspout at Cape Lefkatas, Lefkada Island by the British painter Joseph Cartwright (1789–1829). In 1821, Cartwright was appointed paymaster-general of the British forces at Corfu. This post gave him the opportunity to travel around the Ionian islands and produced sketches of the islands and surrounding area. On his return to England he published a volume entitled Views in the Ionian Islands. source: Cartwright, Joseph. [The Ionian Islands: twelve plates / engraved and colored by R. Havell and son, London, 1821]. Courtesy of Aikaterini Laskaridis Foundation, The Gennadius Library - The American School of Classical Studies at Athens. (Thanks to Stavors Dafis for pointing this to me). Waterspout observed over Lake Geneva on 11 August 1827 from Vevey by Prof. Mercanton at 18:45. Waterspouts on Lake Constance, Switzerland, on 25 June 1833. Waterspouts from "Traite experimental de l'electricite et du magnetisme, et de leurs rapports avec les phenomenes naturels; Atlas" (vol. VI, plate III, Figs. 20-21) (1840) by the French scientist and pioneer in the study of electrical phenomena Antoine César Becquerel (1788–1878). The plate is inscribed "Dessine par M. Bevalet. Grave par Paul Legrand." A tornado (that seems to have started as a waterspouts) observed on 17 July 1850 at New Galloway (Scotland). source: Illustrated London News, 27 July 1850, p. 73. Waterspout in the Isle of Capri (Italy) on 2 September 1855. The waterspout ("Coda del Zefiro"), one of the that moved inland on that day, "inflicted great loss on the proprietors of the soil". The sketch was taken early in the morning from "an elevated spot now dedicated to St. Michaele, formerly formerly the site of the Imperial Palace". source: "Waterspout in the Island of Capri" from Illustrated London News, October 6, 1855, p. 412–413. Depiction of tornadoes and waterspouts from “Natural history of the inanimate creation”. Waterspouts observed in the Mediterranean Sea on 2 March 1850 at 1 pm. source: Caiger, H. , 1856. Extraordinary Waterspout. Illustrated London News, 5 April, 349–350. Waterspout over Rhine at Königswinter (near Bonn) on 10 June 1858 observed by the German mineralogist Gerhard vom Rath (the mineral Rathite is named in his honour). The evolution of the waterspout is showed in Panels 1-5, together with the track of the waterspout and a depiction of the waterspout over land (no source is indicated for this depiction). source: vom Rath,G., 1858: Ueber die Wettersäule, welche am 10. Juni 1858 oberhalb Königswinter zwei Mal über den Rhein ging. Annalen der Physik und Chemie, 104, 631-640. via gallica.bnf.fr. The French and British fleet encounters a waterspout near Kamchatka Peninsula (Russia). Waterspout see at Worthing (West Sussex, United Kingdom) on 21 August 1864. (more information from Worthing History). source: Illustrated London News, no. 1276, vol. XLV, 3 September 1864, p. 252 (via Internet Archive, PDF). Depictions of waterspouts from Thunder and Lightning (1866) by the French science writer and balloonist Wilfrid de Fonvielle (1824–1914). The evolution of waterspouts that occurred on 17 May 1773 off Cape Stephens (New Zealand) based on a described by Georg Forester (1754–94) from A Voyage Round the World (1777) an account of James Cook's second voyage to the Pacific (1772–75). Captain Napier firing a cannon to break a waterspout (May1783). A depiction of a waterspout from "Les Curiosités et les merveilles de la nature" (Curiosities and natural wonders) (1869). source: Munerelle, 1869: Les Curiosités et les Merveilles de la Nature. Dessins par Lemaitre, Arnaud de Vresse, Paris, 141 pp. Waterspout seen between Bournemouth and Poole on 8 September 1871 from Illustrated London News (23 September 1871, p. 272). The sketch is attributed to Mr. Arthur Blomfield, possible the English architect Sir Arthur William Blomfield (1829–1899). Waterspouts over Lake Constance on 4 July 1872 (Fig. 27 from Wegener 1917 via NOAA Photo Library). source: Früh, J., 1907: Wasserhosen auf Schweizer Seen. Jahresberichte der Geographisch-Ethnographischen Gesellschaft in Zürich. Band: 7 (1906-1907) [PDF from ETH Bibliothek]. via tornadoliste.de (event description in German). Tornado over the foothills of Mount Etna on 7 October 1884 based on a publication of the Meteorological Observatory of Riposto (Sicily region). Waterspouts at Menton, on the Mediterranean shore of France, on 12 November 1872.
source: The Illustrated London News, 23 November 1872, p. 492. Different forms of waterspouts (Fig. 3, p. 15). Different forms of tornadoes (Fig. 4, p. 29). Waterspout at Nice on 12 April 1780 (Fig. 10, p. 79). Waterspout over the Atlantic on 6 September 1814 reported by Captain Napier of Erne corvette(Fig. 11, p. 85). Tornado during the Vienna Universal Exhibition on 29 June 1873 (Fig. 16, p. 125). source: woodcuts by Berard and Riou for Trombes et Cyclones by Zurcher and Margole, 1876, Paris, pp. 314. Whirlwind from L'atmosphère by Camille Flammarion (1842 – 1925), translated by James Glaisher (1809 – 1903). source: Flammarion, C., 1874: The Atmosphere. Translated from the French by James Glaisher, Harper & Brothers, Publishers, Franklin Square, New York. (via Internet Archive and Hathi Trust). Water-Spout at Sea from L'atmosphère by Camille Flammarion (1842 – 1925), translated by James Glaisher (1809 – 1903). Waterspout over the Rhine near Cologne on 16 June 1874 observed by R. Peyton. The lithography by Gaston Tissandier (1843–1899) shows the waterspout in full development. The lower part of the waterspout is represented in white, as it had almost the appearance of a "mercury vein", "perfectly cylindrical like the jet which escapes from the barrel of [...] water carriers." "This beautiful waterspout, long and thin, was reflected in the river's water as in a mirror, and offered to the eye a striking image." source: Tissandies, G., 1874: Une Trombe d'Eau sur le Rhin. La Nature, 60, pp. 113–114. Courtesy of CNUM – Conservatoire Numérique des Arts et Métiers (http://cnum.cnam.fr/). A representation (gouache on paper) of a waterspout by the Austrain painter Josef Gabriel Frey (1791–1884). This one of the twelfth depictions from 12 Ansichten atmospährischer Phänomenen (12 Views of Atmospheric Phenomena) (1878). source: 12 Ansichten von atmosphärischen Phänomenen (1878) via The Public Domain Review and Wikipedia Commons. 12 Ansichten von atmosphärischen Phänomenen (1878) by Josef Gabriel Frey. journal La Nature (founded by Gaston Tissandier in 1873). The illustration, showing a tornado that occurred at Norwich on June 1880, is based on a sketch by Duncan Matheson from the Inniskilling Dragoons, who reported the event for the English newspaper The Graphic. source: Une Trombe Observee at Norwich, en Angleterre. La Nature 1880, 366–391, p. 215–216. Courtesy of CNUM – Conservatoire Numérique des Arts et Métiers (http://cnum.cnam.fr/). The dissipation of the Norwich tornado (June 1880) illustrated by Albert Tissandier. Waterspouts observed from Toulon (France) on 28 February 1881. Illustration for La Nature by Albert Tissandier (1839–1906) after a drawing by M. F. Zurcher. Waterspout observed at Toulon (France) on 4 May 1886 at 10am (local time), after a sketch by M. d'Angel. source: Zurcher, F., 1886. Trombe dans la rade de Toulon (Waterspout in Toulon harbour). La Nature, 678, p. 416. (personal collection). An idealised depiction of the F3 tornado that hit Madrid (Spain) on 12 May 1886 causing extensive damages. The Madrid tornado is the deadliest (47 fatalities) tornado that occurred in Spain since 1800. Damages associated with the 12 May 1886 Madrid tornado (from La Ilustración católica, 25 May 1886). A luminous waterspout from "Living Lights" (1887) by Charles Frederick Holder (1851–1915). 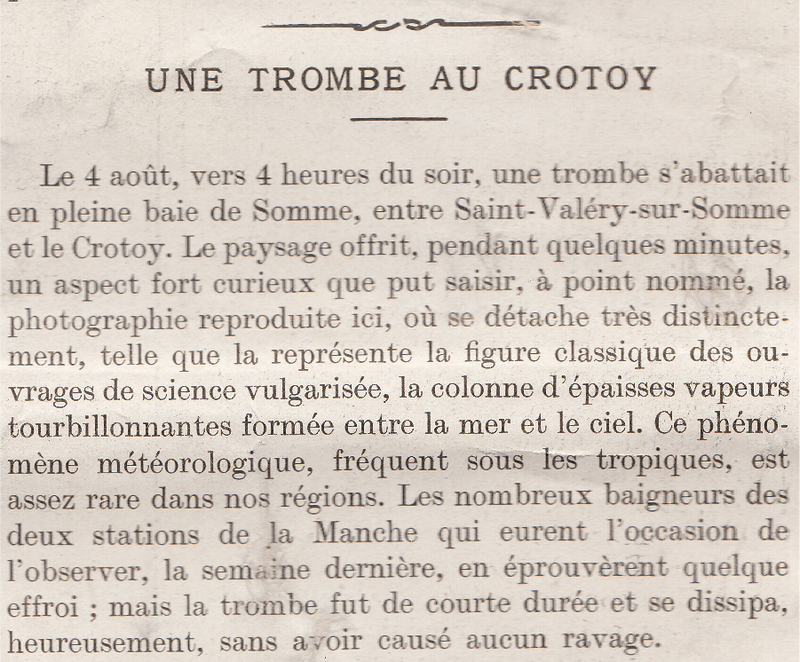 The evolution of one of the five waterspouts observed by Mr. Léotard and Payan, members of the Flammarion Scientific Society, on 17 September 1887 at 5:30 pm south of Marseille toward Planier Lighthouse and Cap Croisette. A waterspout observed in the Bay of L'Estaque (Marseille, France) on 17 September 1887 at 2:00 pm. Depiction of a waterspout from Sur les tourbillons, trombes, tempêtes et sphères tournantes (1889) a book containing laboratory experiments on tornado and waterspout formation by the French engineer Charles Louis Weyher (1836–1916). source: Weyher, C. L., 1889: Sur les tourbillons, trombes, tempêtes et sphères tournantes: Etude et expériences [On whirlwinds, tornadoes, thunderstorms and rotating spheres: Study and experiments], Gauthier-Villars et fils ,Paris, pp. 152. A depiction of a whirlwind from Az Osztrák-Magyar Monarchia írásban és képben. Magyarország 2. kötete (Budapest, 1891) (The Austro-Hungarian Monarchy in writings and in pictures. Hungary 2nd volume). source: Az Osztrák-Magyar Monarchia írásban és képben (image from personal collection). Photography of waterspout observed at Dieppe (northern France) on 10 September 1897 at 1 pm. Source: Photo by Mackeinstein reproduced in a newspaper published in 1901 but so far unidentified (Bogdan Antonescu personal collection). Waterspout at Le Crotoy (France) on 4 August 1910 at 1600 local time. source: L'Illustration, #3520, 13 August 1910, p. 112. A waterspout that moved inland causing significant damages in Genoa (Italy) in November 1909. Updated on 24 February 2017: Waterspouts at Toulon (1881).